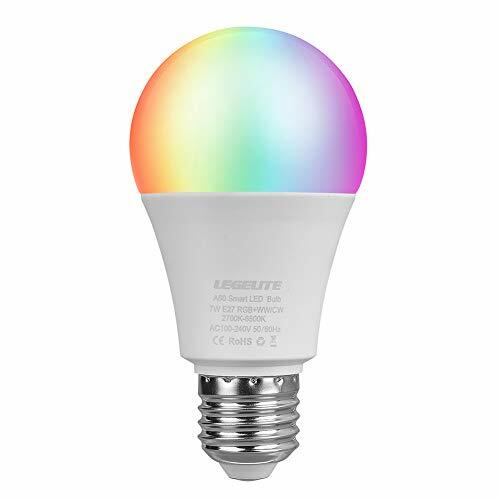 - Voice Control --- Our led smart light bulbs are compatible with Amazon Alexa and Google home, voice commands help to turn on/off the bulb, adjust brightness, change colors etc, No hub required. NOTE: LEGELITE WiFi smart light bulb only supports 2.4 GHz Wi-Fi network. - Make Home Lighting Colorful --- 7W dimmable LED Wi-Fi bulb. It can be used as a common LED light and for special purpose with its multifunctional design. 16 million colors are available, choose different colors to suit your mood. - Timing and Remote Control --- With the "smart Life" APP, you can set turn on/off time as per yourself daily timetable, and you can control the smart bulbs anywhere. Don't worry if you have turned off your lights, just pick up your phone and turn lights off! - Standard Adjustable White Color --- Different from other bulbs, our E27 Smart Light Bulbs provide standard white color instead of mixed white color, you can smoothly adjust it from warm white to cool white from 2700k to 6500k, and you can adjust the brightness as needed. - Save Energy --- Reduce power usage up to 80%, long life make a longer use and reduce replace times. Quality warranty: 60-day money back and a 18-month warranty, please feel free to contact us with any quality issues.